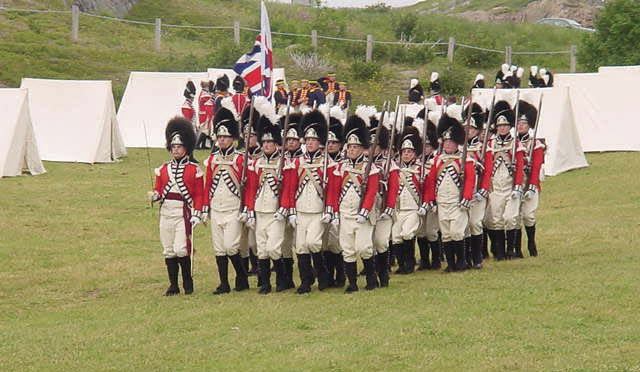 The modern Royal Newfoundland Regiment can trace its beginnings to the first Royal Newfoundland Regiment which was formed on 25 April 1795, when Captain Thomas Skinner of the Royal Engineers, the man credited with designing the defence construction on Signal Hill, was given permission to raise a fencible infantry company consisting of six hundred men. The new regiment was called the Royal Newfoundland Regiment and consisted of a number of troops from the garrison as well as local volunteers. Recruiting was authorized at the rate of six guineas for each new recruit while officers were enlisted from other Regiments or from notables in the town. In terms of pay, clothing, arms and accouterments, the Regiment was to be on the same footing as His Majesty’s other infantry regiments in North America. A strength return for 1796 showed 35 officers and 615 men enrolled. Seventy seven of this number were stationed on Signal Hill, thirty three on South Side, five at 'Quiddy Viddy', and forty at Placentia. Severe shortages in accommodations at the existing town forts prompted the construction of additional barracks at both Fort William and Fort Townshend as well as on Signal Hill. In addition, the Regiment also began detailed plans to fortify Signal Hill by transporting guns to the face of the cliff below Gibbet Hill and by the construction of several shot furnaces for use by the batteries at Fort Frederick, Chain Rock Battery and Fort William. In September 1796 the entire garrison took to Signal Hill to help ward off an anticipated French attack led by Admiral Richery, who was under orders from the Directory of Republican France, to seize English fishing interests in Newfoundland. Governor Wallace assembled the Royal Newfoundland Regiment, the Royal Newfoundland Volunteers and all able bodied men from the town to Signal Hill. Tents were erected at the summit of the hill and at Fort Amherst to give the appearance of a large body of troops. The French fleet landed at Bay Bulls and burned all houses in the settlement but the sight of tents erected atop Signal Hill convinced the French of the folly of an assault on St.John’s so they departed for St.Pierre taking over 60 prisoners who were later released without incident. 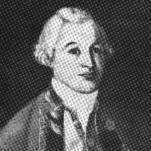 In July 1797 Governor Wallace was replaced by the new Governor, Vice Admiral the Honourable William Waldergrave whose leadership was tested only one month later by a serious act of insubordination among the crew of the HMS Latonia docked in St.John’s harbour. On the 5th of August the crew of the Latonia refused the orders of their officers to go aloft. With the assistance of the Marines the ringleaders were thrown in irons before mutiny ensued. Governor Waldergrave visited the ship with the Grenadier Company of the Royal Newfoundland Regiment. He threatened to order the Gun Batteries on shore to fire upon the Latonia should further incident of mutiny occur. The Governor’s stern response ended the crisis without further incident. Copyright © 2012 Royal Newfoundland Regiment Advisory Council. All rights reserved. Hosted by Memorial University of Newfoundland and Labrador.